Five years later, Savannah Boudreaux couldn’t be happier as a small-town Southern doctor and single mom to a young son. There’s only one thing missing. Her stepbrother, Garrett, has just been released from prison, and although he may be a free man, he’s become a bitter shadow of the kind and caring man who once came to her rescue. Now Savannah will cross the line to save Garrett from himself: to prove that he can live his life, love whoever he wants...and be a wonderful father to their son. I found this to be a somewhat unusual story, which did a good job of bucking some obvious trends. At times it didn't feel like it held together very well, but I liked the premise behind the book. It is difficult to explain much more than that without revealing spoilers. There are some good scenes and the side characters, such as Violet, add to the story. Probably the most inconsistent element is the parents. They are either genuinely clueless, or not the great parents they are claimed to be! Laura Marie Altom is the author of more than fifty books in three different genres. Now that her kids done with college, Laura spends her days writing and chasing after a menagerie of pets: a mini long-haired dachshund named Cocoa, a Yorkie named Chewie, a mutt named Sweet Pea, a GIANT kitty named Foxy, and Domino—a black-and-white stealth cat she rarely sees. She’s happily married to her college sweetheart (go, Hogs! ), and when night falls, Laura steals a few romantic moments for herself with her own hunky cover stud. 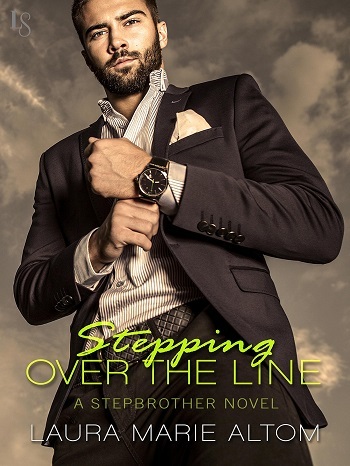 Reviewers on the Wicked Reads Review Team were provided a free copy of Stepping Over the Line (Stepbrother #1) by Laura Marie Altom to read and review.